Ever feel like you are stuck in mediocrity? Many equipment finance sales people say they want to increase volume, yet they remain in the middle of the pack. Despite having incredible potential and intelligence, they achieve unexceptional results. They are just an average Joe, not too high, not too low. The 2017 Masters Golf Tournament is a classic lesson for average Joes. Sergio Garcia, a professional golfer with loads of natural talent, had never won a major tournament. Even though he played in 73 majors over eighteen years. Garcia is one of the top golfers in the world; he’s not average. However, he didn’t get the results he dreamed about. This year’s Masters seemed like it was going to be the same sad story. Garcia was in the lead and needed just one short putt to win. He missed, and there had to be a playoff. The Internet was buzzing with snarky comments with the common theme: “Sergio chokes again.” Then the most unlikely thing happened; he pulled it together. He won the playoff and finally broke into the top echelon of pro golfers. Garcia entered the golf scene with major fanfare; similar to the way some sales people are hired. Management gets so excited about the potential of a new rep, that they get visions of dollar signs dancing in their heads. They feel like they have hired a protégé. The equipment finance industry, like golf, is filled with opportunity and high expectations. But bad habits can bring about heartbreak and despair. Here are some examples of bad habits shared by Garcia and chronic average sales performers. Unprofessional Traits. Sergio was his own worst enemy. At Bethpage Black in 2002 during the U.S. Open, he kept re-gripping his club and slowed down play. The tough Long Island crowd started to mock him by counting the number of times he re-gripped. His response? Flipping the bird. In 2007, he participated in more unprofessional behavior by spitting in the cup (the hole, the place you put your hand in to pick up the ball…eeew) after he missed a putt at Doral. Moodiness. Average performing reps are easily distracted and sulk when things don’t go their way. Garcia was a world-class sulker during two-second place finishes in 2007 and 2008. 1. Committed. Despite difficulties, he remained patient and undaunted. This is vital for sales people. Don’t simply consider making more prospect calls, commit to it. Reps have the power to increase their volume, profits and results. They need to be adamant about protecting their time. Don’t get caught up in activities that do not produce sales and income. When you make a big commitment, you get big results. Take yourself seriously. Don’t give up at the first hint of rejection. 2. Transformed Attitude. The thoughts we think, the words we speak and the beliefs we hold are powerful. To go from average Joe to Sergio, a rep needs to first make the changes in their mind and then their volume will respond accordingly. One way to do this is to put inspirational quotes around you: “Attitudes are more important than facts” wrote famed psychiatrist Karl Menninger. Garcia’s fiancée, Angela Akins, covered the bathroom mirror of their Georgia rental home in green (When you win The Masters you get a green jacket.) sticky notes, each featuring a motivational quote. She also had friends and family hand write letters on green paper stating two things: why they loved him and why they knew he could win. Phil Laut, the author of Money is My Friend says, “Increasing your wealth is a matter of increasing the quality of your thoughts.” Garcia increased the quality of his thoughts and increased his wealth by millions in just one day. He thought differently then he had in his past 73 attempts. He made different choices and produced a different outcome. 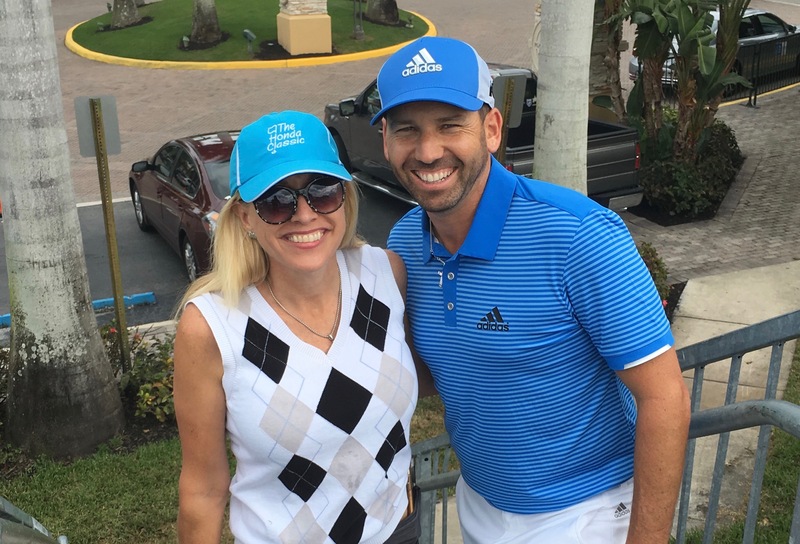 What Sergio discovered is that greatest hurtle is never “out-there.” Success is an inside job. 3. Embraced discomfort. People resist change because it makes them feel uncomfortable. Was Garcia uncomfortable? Of course. It was different. He was tapping into the challenge of change. Are you willing to feel uncomfortable for a little while? Sales techniques such as trying new opening statements, staying on the phone longer with a prospect, and asking for a meeting three times can feel scary and uncomfortable. Realize that it’s not going to be uncomfortable forever. It’s only for a short period of time until you get used to it. Resistance to change is inevitable. It’s a signal that you are leaving your comfort zone, acknowledge it, embrace it and then plow forward. Ever see a rep that is desperately trying to make a deal close, but ends up pushing the deal away? It happens all the time. The rep that is not emotionally attached to the outcome says “ If it happens great, if it doesn’t, it’s okay. I have plenty more in my backlog.” is the one who wins the deal and closes the transaction. Embrace the four habits that Garcia used: Commit to increasing your prospecting effort, improve your attitude and the quality of your thoughts, realize that you are going to be uncomfortable and release attachment to the outcome. Then you’ll be on your way to MAJOR sales achievements.